The Cuisinart 6354-24H chef's classic 4 Qt. chef's pan with helper handle features thick, hard-anodized aluminum construction which conducts heat evenly and efficiently through the sides as well as the base. The deeper design of the pan provides the capacity needed for family-sized, one-dish entrees or side dishes, and allows flavors to mix when preparing a stew or pasta sauce. The 6354-24H features Quantanium & nonstick cooking surface which is reinforced with titanium for lasting food release, healthy cooking and easy cleanup. Ideal for the novice or gourmet cook, the chef's pan has a helper handle for perfect balance, and tight fitting lid to keep food moist and tender. The 4 Qt. Chefs Pan W/ Cover Chefs Classic Ns Ha has many exciting features for users of all types. See the 4 Qt. Chefs Pan W/ Cover Chefs Classic Ns Ha gallery images above for more product views. The 4 Qt. 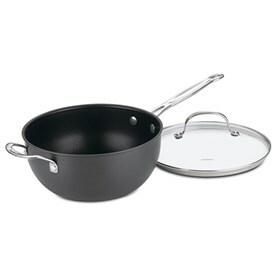 Chefs Pan W/ Cover Chefs Classic Ns Ha is sold as a Brand New Unopened Item.